(Leah Hogsten | The Salt Lake Tribune) BYU's Brock Hale celebrates his scoring run in the 3rd inning to even the score 2-2 as Brigham Young University hosts University of Utah at Miller Park, Tuesday, April 24, 2018 in Provo. Provo • Right fielder Brock Hale believes every member of the 2019 BYU baseball team has his back this season. The senior from Mesa, Ariz., isn’t sure he could say that last year when the Cougars were picked to defend their 2017 West Coast Conference title and make it back to the NCAA Tournament, but faltered mightily and finished with a disappointing 22-28 record and out of the four-team WCC tournament. 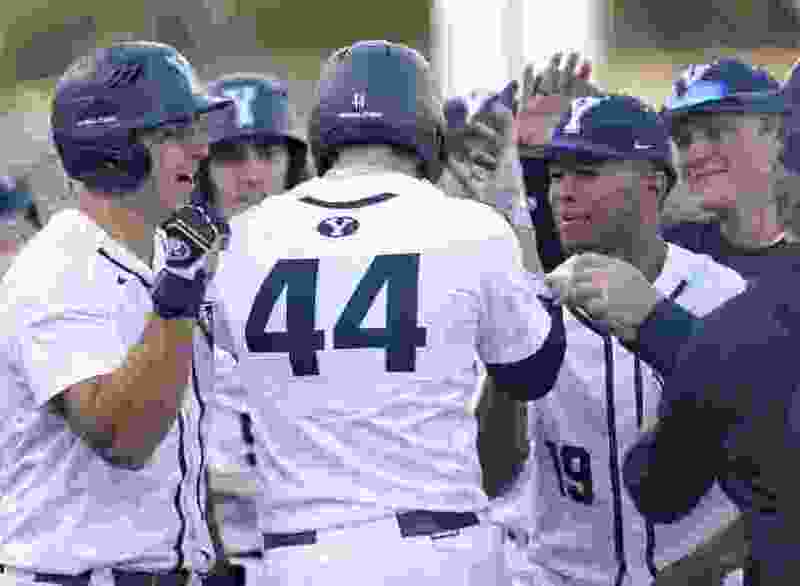 With Hale and other seniors such as infielders Brian Hsu and Casey Jacobsen, catcher Noah Hill, pitcher Jordan Wood and outfielder Keaton Kringlen leading the way, BYU is having one of its best seasons in years. The Cougars are 24-9 overall and tied for second in the WCC race with a 10-5 league record, a game behind league-leading Loyola Marymount (22-13, 11-4). They step away from the WCC race this weekend, but still have an important three-game series at Washington (16-15) Thursday (7 p.m.), Friday (7 p.m.) and Saturday (2 p.m.). The nonconference set is huge to their hopes for an at-large berth into the NCAA Tournament if they don’t win the WCC tournament, because the Cougars’ RPI is 42. Littlewood said BYU’s RPI probably has to be in the 30s, and the Cougars probably have to win a game or two in the conference tournament, to get an at-large berth. Littlewood said BYU’s policy of not playing on Sundays “is detrimental” to getting into the NCAAs because teams in whatever sub-regional BYU is sent to have to move their pitching up a day for a Thursday-through-Saturday series. Many schools balk at doing that. Regardless of their postseason aspirations, fun is a good way to describe this season, after last year’s showing. The Cougars were picked to finish sixth in the WCC, but Littlewood said in February that this team was going to exceed expectations. That wasn’t the case last year, Littlewood and Hale said. That’s why Littlewood “cleaned house” by pushing 8-10 underclassmen out the door — some left willingly — and worked all offseason to change the culture in his program. He added 17 newcomers and three recently returned missionaries, and found a gem in new pitching coach Michael Bradshaw, who was Arizona’s assistant director of baseball operations from 2015-18 and before that a pitcher at Nevada. Pleasant Grove product Easton Walker is 4-0 and has one of the best earned run averages in the country (0.82) , while fellow starters Justin Sterner (6-3) and Jordan Wood (4-1) have also been solid. Littlewood said reliever Reid McLaughlin (5-0, 1.54 ERA) “has been the most surprising guy on the entire team.” Drew Zimmerman, a right-hander from Lehi, has taken the closer role and excelled. Offensively, Hsu leads the team with a .383 batting average, while sophomore infielder Jackson Cluff, from Meridian, Idaho, has returned from a church mission to Atlanta and made himself a prospect for June’s major league draft. Cluff is hitting .361 with 40 RBI.